​When addressed before critical obstruction or strangulation, your surgeon can repair an inguinal hernia in a minimally invasive fashion. Laparoscopic techniques including robotic surgery allow for a quicker return to activity and less postoperative discomfort compared to open procedures. When conditions allow for the use of the daVinci robot, patients experience less post-operative pain due to the robotic “wristed" instruments that allow for the precision movements required for internal suturing during the surgery. Before the introduction of robotic technology, this type of suturing was not practical. In most cases, robotic-assisted laparoscopic inguinal hernia repair is an outpatient procedure. Your surgeon will use a mesh patch for inguinal hernia repair when needed to decrease the chance of recurrence. Other types of hernias including incisional hernias can also be repaired using the advantages of the daVinci robot as well. During this type of surgery, your surgeon closes the defect in the abdominal wall and sutures a mesh patch over the closed hernia with the aid of the surgical robot. This type of surgery allows for a quicker recovery and only occasionally requires a brief hospital stay. 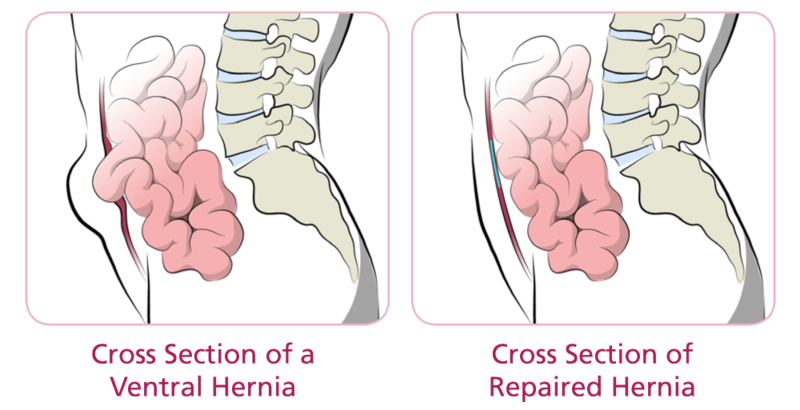 Your surgeon will select the safest surgical approach for you taking into consideration the number of adhesions or scar tissue within the abdomen and whether or not the hernia is affecting the intestine. When addressed before critical obstruction or strangulation, inguinal hernias can often be repaired in a minimally invasive fashion.